The life was literally being sucked out of her. When eleven week old Tic Tac was carried into TM’z Veterinary Clinic last Friday, seven hundred blood sucking ticks came in with her. The parasites were growing stronger while the puppy faded away. 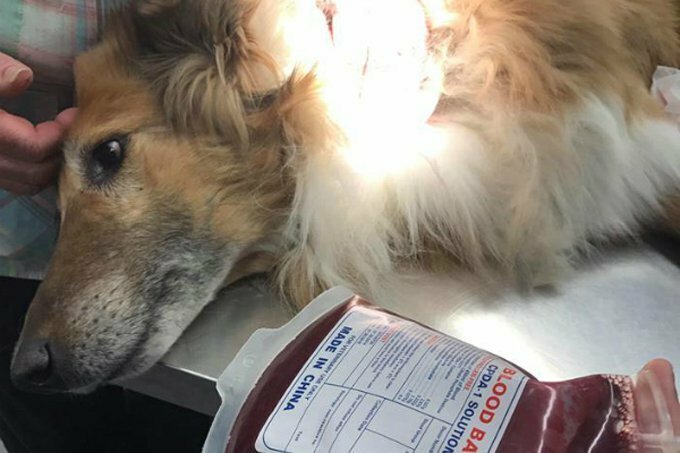 She needed blood, and thanks to her veterinarian’s dog, she was about to get it. “If you look at the tip of your pinky right now, that’s how big these ticks were, and that’s a lot of blood they were holding,” explains Caillin Rodonets, the co-founder and director of CC RezQs Regina in Saskatchewan, Canada. 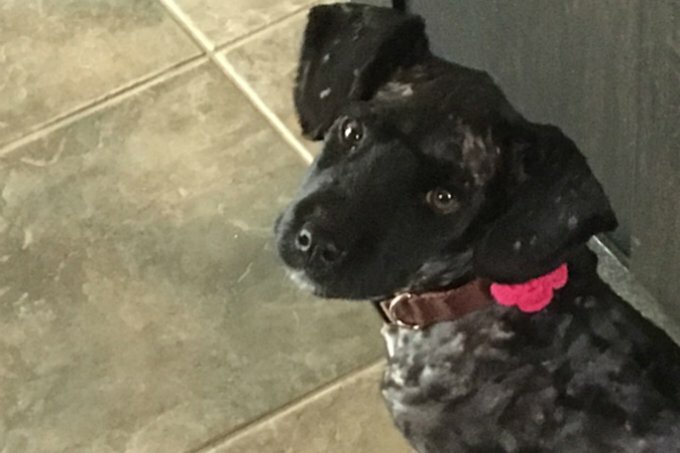 Found near the Saskatchewan-Manitoba border, Tic Tac’s life-saving trip to the vet began when Caillin was contacted by the chief of the Kahkewistahaw First Nation. “He messaged us right away, saying ‘we’ve got this puppy. She’s lethargic, she’s not getting up, she’s just really weak, covered in ticks and she needs help, now.’ That kind of got the wheels in motion,” she says. Because Caillin and the other members of CC RezQs all work full-time, none were immediately available to drive the two hours to Kahkewistahaw to pick up the Shepherd mix pup. They put out a call out for volunteers, but in the meantime a member of the community was able to drive the puppy to the city of Regina and into the custody of CC RezQs. Too weak to move at all, Tic Tac was then rushed straight to TM’z Veterinary Clinic in nearby Lumsden, Saskatchewan. As clinic staff and rescuers pulled ticks from Tic Tac’s skin and shaved her fur, Dr. Tanya Marshall administered IV fluids and started tests to determine if the puppy’s immobility was caused by tick paralysis or just anemia from loss of blood. It turned out to be the later. After being bribed with some delicious food, Kelso agreed to sit still and give blood — a process that takes about half an hour, according to Caillin. His efforts turned out to be well worth it. Within thirty minutes of getting Kelso’s blood into Tic Tac, her rescuers began to see an improvement. “Her gums went from a grey-white colour to starting to return to a pinkish colour. She sat up,” says Caillin, who was incredibly relieved. 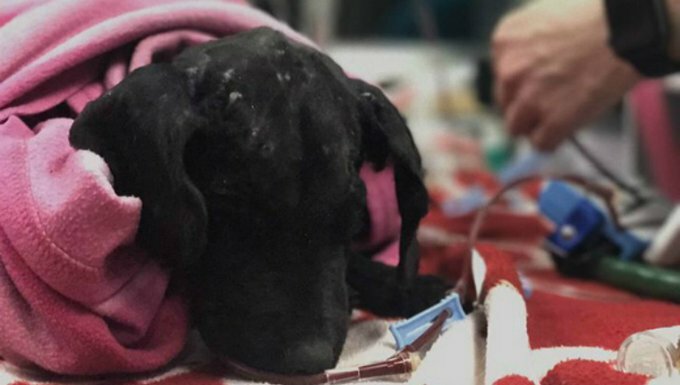 Although she’s rescued dogs with far more ticks than Tic Tac was carrying, she’d never before had a case so bad it required a blood transfusion. Thanks to Kelso’s gift, by the following morning Tic Tac was back on her feet and in full puppy mode. When a veterinary tech assistant took her out for walk, Tic Tac romped around the clinic with her tail wagging, eagerly jumping up on the people who had worked into the night to save her life. “She is a different dog,” says Caillin, adding that Tic Tac has gained more than six pounds since her rescue. Now in foster care with a TM’z Veterinary Clinic staff member, Tic Tac continues to grow stronger every day — even if she doesn’t look that great at the moment. Tic Tac can’t be put up for adoption yet because her body score is still too low to allow for proper vaccinations. Right now, CCRezQs is focusing on raising funds to pay off Tic Tac’s $1,200 vet bill, and will start considering adoption applications once Tic Tac is fully healthy. “We’re looking for someone who is financially ready for an animal, emotionally ready for an animal, and whose work schedule allows for an animal,” Caillin explains. 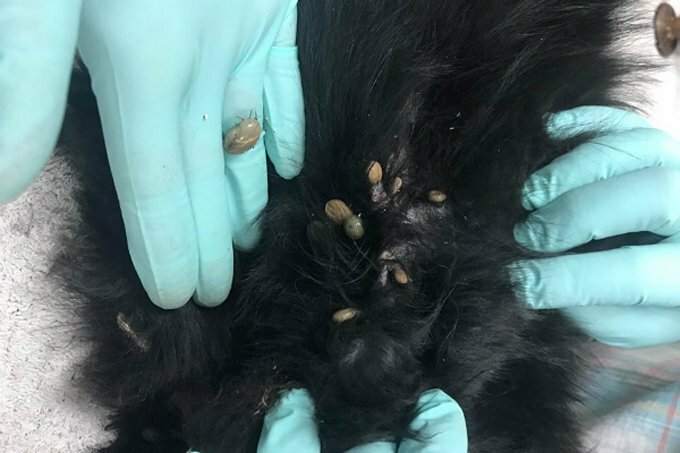 The experienced rescuer says Tic Tac’s case illustrates why tick prevention is so important for pet owners — not just in rural Canada, but in the United States as well. Experts are predicting an increase in tick activity this year due to mild winter temperatures. It’s recommended dog lovers talk to their vet about tick prevention and check their dogs daily.